Just an example is what I need to point me in the right direction. RE: Monaca Localkit Project Creation Problem. Hi, I have since purchased Monaca but I still have the same problem. When I create a new project I get the alert box with no text in. When I click on the “OK” button the New Project dialog remains in place. However if I click “Cancel” I find the project has been created in the correct folder. Hi, I am trialing Monaca at the moment but I have encountered a problem using Monaca Localkit App (operating system, Mac with Mojave installed). 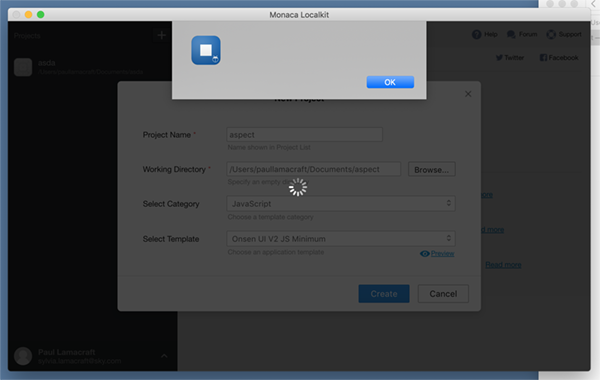 Clicking ‘Create’ will still build the project and directory but will just keep the New Project dialog box in place. Subsequently clicking ‘Cancel’ removes this dialog and I can open the project with all the files in the correct location.